There is often more than one avenue to doing something well. Similar to a finely tuned orchestra, many factors play into the development and ramp-up of a successful longwall operation. 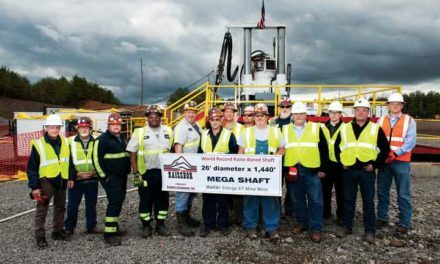 ACI Tygart Valley’s Leer complex, an Arch Coal subsidiary, in northern West Virginia is certainly singing on key with the success of one of the nation’s newest longwall operations. Mine Manager Tim Runyan (front) and Longwall Coordinator Shawn Grimmett monitor the work of the longwall, which will help Leer mine produce 3.3 million tons in 2015. Leer mine first initiated production in late 2011. Its longwall came online in early December 2013 and it spent part of 2014 ramping up to its annualized production goal of 3 to 3.5 million tons. The mine has quickly become the center of attention in its home of Grafton, West Virginia, for more than one reason. As many of its neighbors in the Northern Appalachian region struggle, Leer is managing through industry headwinds, headstrong and tenacious. 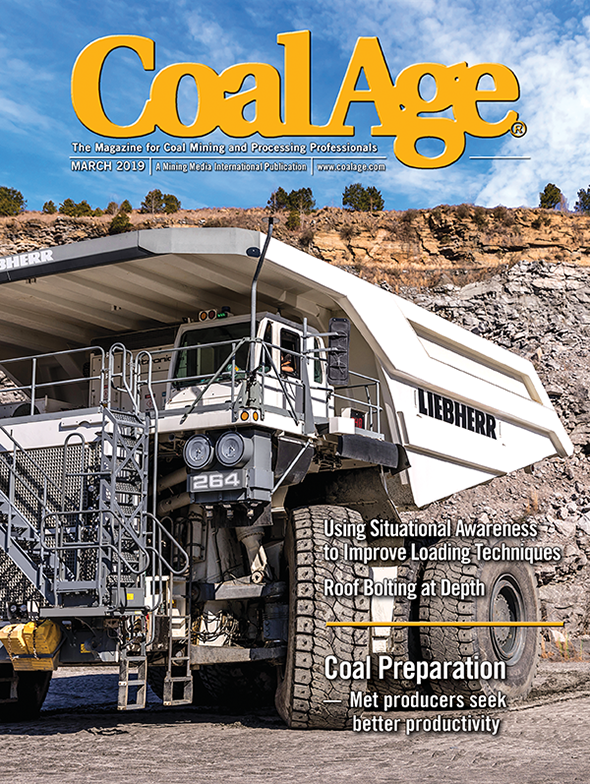 The high quality, high-vol “A” metallurgical-grade coal that it produces from the Lower Kittanning seam is attracting global market attention and is setting benchmarks for safety, operational costs and efficient mining. Arch invested more than $400 million on the development of the Leer mine. Much of the operator’s intent has come to fruition, including acquiring top talent to guide everyday progress and obtaining cutting-edge equipment and technology to keep it moving efficiently long-term. Accessing Leer’s enviable 45-million-ton reserve is easy, with an elevator to reach the mine’s main entrance situated 315 feet underground, not far from the mine’s average depth of cover of about 550 feet. A short trip via one of Leer’s track-mounted Brookville mantrips will put crews within just a few breaks of the latest panel in what mine management refer to as District 1. The mining area was nearing completion at press time, with management aiming for a mid-May wrap-up and subsequent move to District 2, as continuous miner sections complete development to ready the area for the move. The face is almost entirely “Joy Orange” with a Joy 7LS1D pulling coal from the 1,200-ft-wide panel. Panel lengths are 5,000 to 9,000 ft, with the current panel measuring about 5,155 ft. Work moves along at a clipper pace thanks to the shearer’s 60 in. x 42 in. drum, matched nicely with 4,160 volts of installed power. 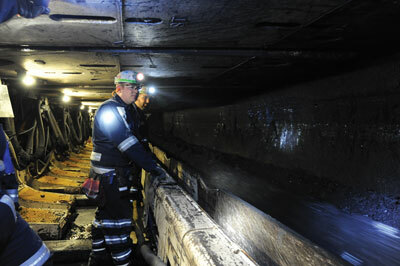 Cutting height at the longwall is approximately 78 in., with no coal left in the floor or roof. The face conveyor is made up of Joy’s 1,000-mm race width with 42 mm x 146 mm flatline chain moving at about 340 fpm. Horsepower is no problem here, with triple 1,072-horsepower (hp) motors handling the work. 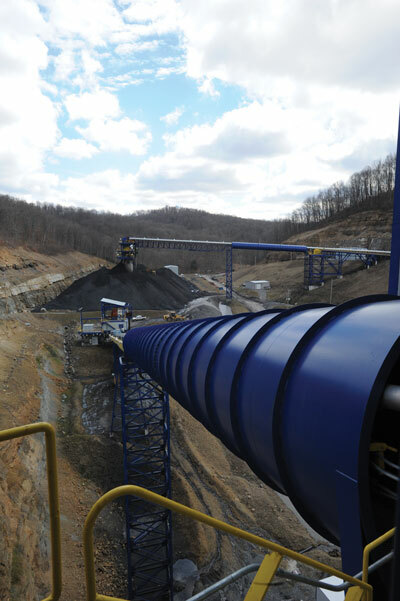 The West Virginia mine, located in Grafton, has an enormous conveyor infrastructure both underground and at the surface, including this overland section that delivers tonnage to the Leer preparation plant. Before the coal makes its way out of the mine, via the mainline belt infrastructure on a 54-in. headgate beltline, it passes across a Joy 450-hp BSL/crusher broadband chain, itself 42 mm x 128 mm. A 450-hp Joy V-belt completes the last work here while the shearer begins a new pass in front of 208 two-leg shields. The 1040-ton yield Joy RS 20S-controlled supports have a working range of 50 to 102 in., keeping things moving along safely for all working at the longwall. The availability of the longwall and shearer is an impressive 95% or higher on average, which mine managers attribute to great communication between production and maintenance crews. Daily checklists allow all crews to report and resolve issues as they arise. 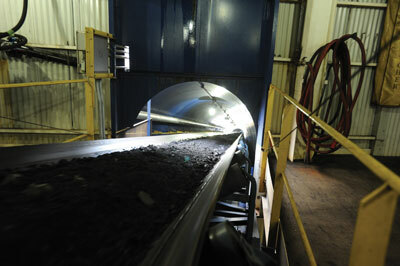 Ventilation at Leer is handled by a blowing main mine fan system. Crews are currently testing various water-mix dust suppression products that are applied at both the face and the shearer. Longwall methane is managed by bleeder fans (development methane is managed with auxiliary face fans). One item mine management has taken great focus on has been roof control maintenance. The great effort the mine has taken also shows in its development; typical dimensions underground include 16 ft entries, gate pillars of 100 ft x 120 ft, and mains of 70 ft x 120 ft There are three entry gateroads and eight entry mains that make up the mine’s arterial structure. Roof support is on a standard 4 ft x 4 ft spacing pattern in the roads using 6-ft fully grouted resin bolts. At the entries, 10-ft cables on 8 ft x 8 ft spacing is used, and intersections apply 8 ft x 4 ft spacing. Leer does utilize rib bolting in the belt entries of mains and submains at 8-ft spacing, and it also incorporates roof mesh in its track, belt and escapeway entries. All of its development sections are place change, and the equipment fleet includes Joy 14CM15 continuous miner units, North American Rebuild Co.’s (NARCO) 10SC shuttlecars, Fletcher twin-boom roof bolters and Fairchild scoops. Continuous miner tons in development areas get loaded onto 48-in. belts, where is the coal is carried to the mains at 2,400 tons per hour. 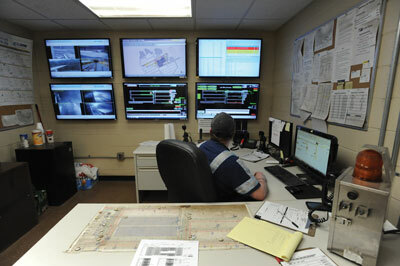 Mine equipment and system monitoring, as well as communications and tracking, are all managed by dispatcher Charles Holley in the control room at Leer’s main office. Completing the mine’s belt infrastructure, which is entirely Joy Continental, is an impressive line of 72-in. mainline belt rated at 7,600 tph. There are no notable obstacles in the belt system to its production capacity. Development for future longwall panels is on schedule. 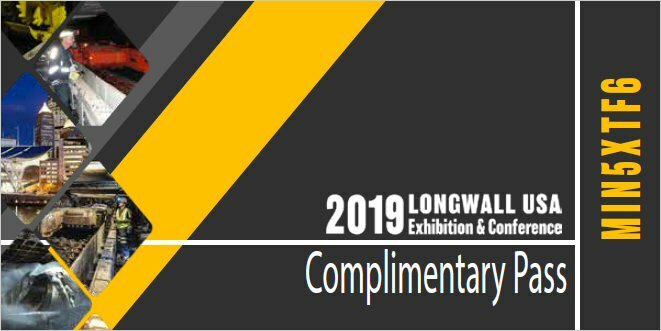 This summer when the next longwall move occurs, Leer will be ready with a protocol already in place that has served it well since the mine’s inception. The moves include pre- and post-move meetings as well as the pre-delivery of recovery and set-up supplies. Pre-move discussions involve making crews aware of any potential hazards, and post-move gatherings focus on improvement ideas in an effort to make future moves safer and more efficient. The mine’s bolt-up processes include a combination of panline bolters, fletcher single-head bolters and Micon Z drills. Leer’s overall proactive approach to operations meshes well with its maintenance protocols. As Runyan noted there is a high level of focus on pre-operational checks and reporting issues. It also has found benefit in developing maintenance schedules to allow for extra manpower during idle periods (mainly on Saturday and Sunday). A focus on PMs and sampling is also part of the mine’s proactive program, and management noted that it receives good support from OEMs and suppliers such as Joy, Becker Mining America and Morgantown Machine to keep its fleet maintained to the respective OEM standards. Leer works closely with IWT Wireless and Victor Products, the respective manufacturers of the mine’s primary communications and redundant systems. Runyan said there have been no significant problems with either system reported by any of the mine’s employees. Mine monitoring is mainly handled by Joy Faceboss and Conspec (PLC/HMI). With such a large staff and lofty goals for both production and safety, Leer’s management is happy to be able to boast of its efficiencies in both areas. Leer’s YTD total incident rate (TIR) is 1.52. In terms of cost efficiencies, Runyan noted that one of its biggest money and time savers has been overcast and belt channel construction. The Leer prep plant operates at 1,400 tons per hour and uses heavy media cyclones as well as reflux classifiers and column flotation. Now, cutting overcasts and belt channels is done by cutting down the roof and ramping on top of cut material to achieve desired construction heights. “The practice of ramping on top of the material has expedited the construction process while decreasing continuous miner wear and possible operator exposure to dust,” he said. Additionally, during the extraction of the first and second longwall panels at the mine, the mine utilized cans and cribs for gateroad secondary support. Longwall face operators Ross Brown (front) and Ben Holden keep a close eye on the longwall, featuring a Joy 7LS1D pulling coal from the panel with a 60 in. x 42 in. drum. Currently, Leer mine is projecting its 2015 production to be around 3.3 million tons. The long-term outlook for Leer is very positive, he added. “Preparing for the future, we have started the initial permitting and engineering for the Tygart Valley reserve block, a block that is contiguous to the current operation. These are the same reserves in which Leer currently operates, and will offer a consistent high-vol ‘A’ metallurgical quality coal that can support new operations, and perhaps another longwall mine. Leer’s success in its ramp-up has also enhanced Arch’s entire metallurgical coal quality portfolio and at the same time has improved the region’s cost structure. Leer mine, along with operations across Arch Coal’s operating platform, engage in a proactive behavioral-based safety (BBS) approach that enlists all employees to identify and eliminate at-risk behaviors through employee-conducted observations. In 2014, Arch Coal continued to be a leader in safety performance among its large diversified peers and tied its best safety record in the company’s history. It also is one of the first mines in the nation to incorporate Draeger SCBA air supply stations for use as needed in addition to its standard supply of Ocenco M-20s and 6.5 SCSR units. There are currently eight stations of tanks and donning supplies, including tank fillers, throughout the operation, for a total of about 100 units currently in place. 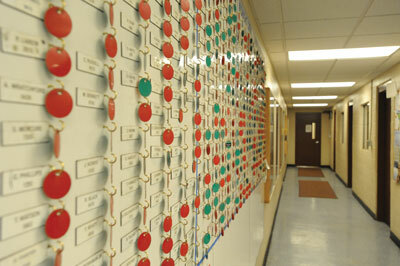 Management plans to add more air caches in phases.